Ron Molnar ran across this YouTube video of Nick Holonyak that is credited with inventing the LED. I understand that M. George Craford is one of the speakers at the event. Reunion photos and videos on the web site now! We now have the photos and the videos from the May 5th Reunion on the web site. The Great ReunionGood Morning: I am still having a hang over from the great reunion weekend. The site is cleaned up, all the rented tables have been returned and most of the left over food eaten or given away. I took three of the small bags of those great cookies but had eaten those by Sunday. The heavy duty extension cable is still out there but hopefully today I can get it rolled up and returned to our ranch electrical contractor. And John many phone calls re the super story in the Press Democrat. The ten member home team drank up the rest of the sangria before the day ended. That Sangria included a huge shot of brandy so Marjorie had to drive me back home from her house where we were having a post party critique. We all continue to be astounded at the incredible staff work your reunion team did in the five months from January to May!! There is a huge story here. And the recovery work on those anniversary photos that somehow you found and patiently pieced name by name. Fantastic! Fantastic! And the huge effort to collect dinner funds check by check b y check. And some how you pried biographies one by one! And the super `site` with all those great photos. I am astounded someone found the picture of me with my arms around two beautiful young women at our Fifth Anniv Party. My family tells me that today I would be hauled off to jail for sexual harassment! And not to be overlooked the reunion team bought some $3,000 worth of wine. Thank You!! Finally the so therefore for all our group work years earlier and work since when in his speech George Craford told us that in some fifteen years our and others LED work will enable us to shut down some 50 of the dangerous Nuclear Power Plants and provide us and others around the world safe light!! Way To Go!! This continues to be such a special project of such huge importance that I am asking for suggestions as to how we may be able to still keep this dream alive? In the mean time thank you and every member of your team for an incredible piece of work. And of course to others who responded but for one reason or another could not come we will see you next time!! With thanks, cheers, good vibes, and great affection George and Greta and The Family at the ranch. Santa Rosa Newspaper Article in Sunday's Paper! The Press Democrat published another wonderful article about George and the LED reunion. Here is an electronic copy. Just click on the link below. Check out the Video about MacLeod Family Vineyard! GREAT! Jean Davia just made me aware of this video that will give you a little flavor and history about the the place where we will meet in about a week. I can not wait to taste George's wines. It is not too late to make your reservations if you have not done so already, so do it now..... and don't miss the fun and good times. Reunion Article in San Jose Mercury News Today! We got good coverage about our reunion today on the first page of the Business and Technology Section. Check it out! Warm Days are Here at the MacLeod Family Vineyards! Just a couple of weeks before our reunion folks!. Please make your reservations and send your check as soon as possible. We really want to get an accurate head-count. Is there any reason why you can not make it? Great food, scenery, wine and old friends. Probably our only reunion, so don't miss it! Good News! Reunion Lunch Now Only $40! Thanks to the generosity of George MacLeod and his winery, we were able to reduce the price for the fantastic luncheon. The price is now only $40 per person. We want to make it as affordable as we can so that you all have the opportunity to attend. Please make your reservation as soon as you can! Just learned from Elka Duffy, Peter Duffy's wife that he is suffering from stage IV colon cancer. Peter was the quality control manager at Monsanto Opto. We will surely miss him at the reunion. We wish Peter all the best and send our prayers to Peter, Elka and the Family. In a fairly recent article in "Travel and Leisure" Magazine, an editor described his experience at George's Vineyard. I thought I would share this with you as this is what we can expect at our May Reunion. ONE MORNING AT 7:15, THE PHONE RANG. IT WAS GEORGE MacLeod, a local winemaker. "You've got to come right now-they're here!" It was the first of a few harvest days for the Sauvignon Blanc grapes at MacLeod's vineyard, which happened to be just next door. The harvesters had arrived-a group of Mexican workers who'd been picking his grapes for the past 30 years. They'd come before dawn and would be done within hours-20 tons of grapes later. MacLeod and I had been introduced by the owner of the house we'd rented, and he'd invited me to the harvest. His is a relatively tiny vineyard: most of his grapes go to larger producers, though he also bottles his own (very delicious) wine. It was a beautiful morning-cool but with the promise of warmth soon to come, and heat not long after that. There was mist hanging over the vines, and disembodied, otherworldly voices calling out now and then in Spanish. We'd met at the barn and now MacLeod was walking me through the property, stopping to chat with various foremen and workers, handing me grapes to taste, and generally talking without pause, like the born raconteur that he is. About the grapes, the wine, and the soil, and about the rocks in the soil (there were many of them when he bought the land, dug up and removed with backbreaking effort). He was wearing an old Monsanto Roundup branded windbreaker-he retired from the agribusiness giant in 1979; the vineyard was his dream, a "retirement project" that became the family business. He explained, all irony aside, how the vineyard was now going organic. A few days later, we returned for an open-air wine tasting. 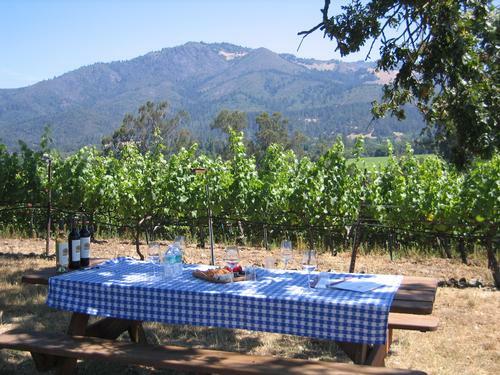 My wife, father, daughter, and I sat at a picnic table in the shade of a huge old oak tree in the middle of the hilly vineyard with MacLeod and his daughter-in-law Marjorie. We picked some grapes and compared the taste of the sweet juice with the wines they eventually produced, taking measure of the winemaker's alchemy.